During the 1960s, Lester Pearson, the Liberal Prime Minister, sought greater involvement of Quebeckers at the federal level. He asked a prominent labour leader, Jean Marchand, to join the Liberal party and come to Ottawa. 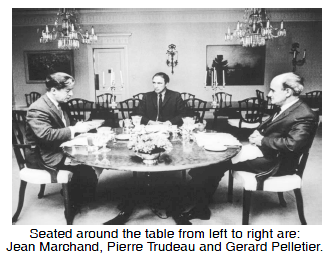 Marchand agreed on condition that two of his political activist friends, Gérard Pelletier and Pierre Trudeau, also come to the House of Commons. All three had been active against the Duplessis regime and Trudeau and Pelletier had founded a publication, "Cité libre," to express their liberal views. The three became known as Quebec's "three wise men." Their participation in federal politics marked a substantial change in the political relationship between Ottawa and Quebec. Marchand has said that, previously, the job of French-Canadian politicians in Ottawa was to sell federal policies to Quebec, to act as the agents of the federal government in Quebec. With the coming of Marchand, Pelletier and Trudeau, Quebec politicians began to take an active part in shaping federal policy, not just interpreting it to their province.